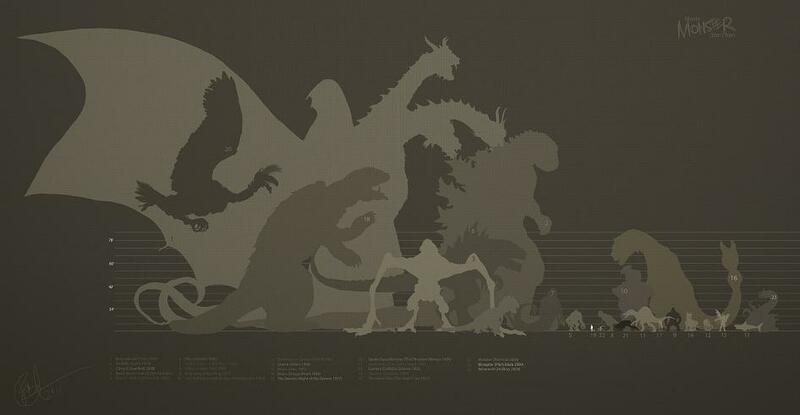 Godzilla Sizes: Comparison Chart. Godzilla Comparison chart. See how Godzilla stands up with monsters from various monster franchises like Cloverfield, Jurassic Park's T-Rex, Episode I: TPM's giant sea monster & of course archenemy, King Ghidorah!. HD Wallpaper and background images in the Godzilla club tagged: godzilla size chart comparison chart eras monster comparison toho kaiju king. This Godzilla photo might contain 标志, 海报, 文字, 黑板, and 文本.